Projecting the SAFVC too far into the future will be unrealistic, because the SAF would look to assess the efficacy of its first volunteers. After the the new Singapore Armed Forces Volunteer Corps (SAFVC) was announced in 2014, I thought the initiative was reasonable, even though I thought hard figures would determine the success of the SAFVC. 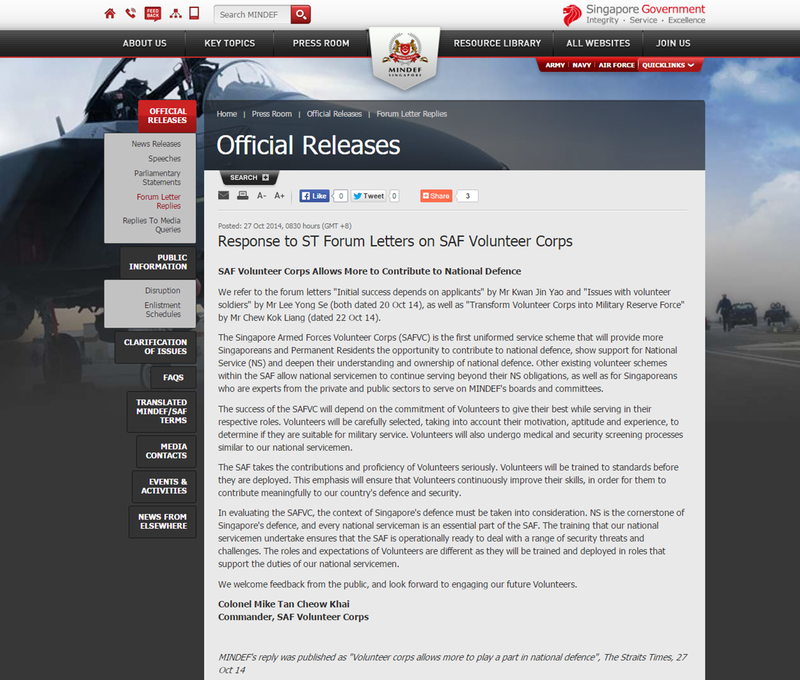 The letter – “Initial Success Depends on Applicants” – was published in ST, and its commander Colonel Mike Tan Cheow Khai penned a reply, “SAF Volunteer Corps Allows More to Contribute to National Defence“, a few days later. With this emphasis of symbolism over utility, the immediate phase of publicity matters. Projecting the SAFVC too far into the future will be unrealistic, because the SAF would look to assess the efficacy of its first volunteers. The initial success of the SAFVC will therefore be measured by the number of applicants across those in Singapore who are not liable for NS, and then by the number who stay in the programme. An uphill task, when one considers the independent survey conducted by the Institute of Policy Studies last year, which found that 13.6 per cent of the women polled were willing to serve two years of NS voluntarily. Perhaps the SAF could have shared its target number of applicants and expected retention rate, which will also shed light on its marketing plans. 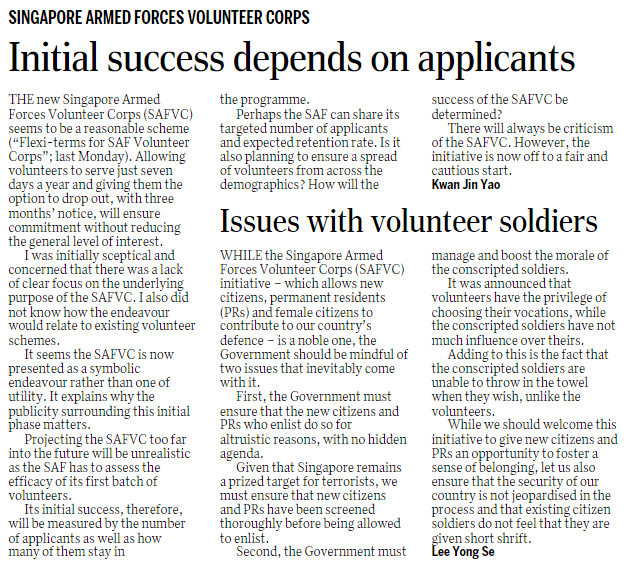 Is the SAF also planning to ensure a representation of the 100 to 150 volunteers across demographics? More interestingly, how will the SAF determine if the SAFVC has been successful?